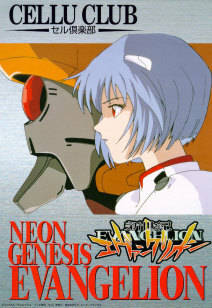 To try to help satisfy Evangelion fan's desire to own cels from the series, Gainax released an official Evangelion Cellu-Club reproduction cel series, consisting of a total of 18 cels that are exact reproductions of authentic Evangelion production cels. The machine made cels were originally produced to be given away as prizes at video game stores. 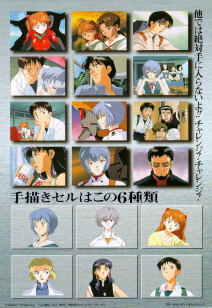 This series consists of a total of 6 limited edition hand painted character cels of Misato, Rei, Asuka, Ritsuko, Shinji, and Kaworu, and 12 other machine produced scene cels with backgrounds. These are the only cels that have even been 'officially' released by Gainax, and are becoming very highly prized among collectors.